Buddha teaches that everything is projected by our mind; and of course this is clear when it comes to movies! But we like to be drawn into them as we like a good story, just as we usually allow ourselves to be sucked up by the drama of our own lives even if we know it is not real. For me movies can be a time-wasting distraction or they can be helpful. It depends on whether I’m watching them out of some delusion/unpeaceful mind such as attachment or laziness, or out of some positive motivation such as the wish to expand my horizons to empathize with others. Nothing is completely untransformable if we have the wish, capacity and methods to do it – even violent movies could be seen as a battle against delusions. Of course, it is risky to watch movies that may engender unpeaceful, uncontrolled reactions such as hatred or anger in us, so it is worth being honest to ourselves about our level of mindfulness and our ability to transform appearances to stay peaceful. It is worth protecting ourselves by not straying over certain boundaries (as in the practice of moral discipline). If we’re going to watch a movie, some movies are probably easier for us to transform and derive meaning from than others, and I personally count Kung Fu Panda as an example. I watched it on the airplane and found a lot of uplifting Buddhist teachings in it. So I thought I’d share a few seeing as Kung Fu Panda 2 is coming out on May 26 and no doubt some of you will be watching it, especially if you have the excuse of kids! My favorite theme is the transformative relationships between the Masters and their students. 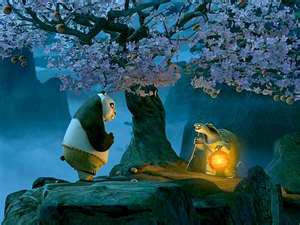 The Panda Po says to Master Shifu, “You are not my master!”, but that changes when he believes he can learn to be a great Kung Fu warrior and that Master Shifu can teach him. Similarly, we only need a Spiritual Guide if we decide we want to follow in his footsteps along a spiritual path. 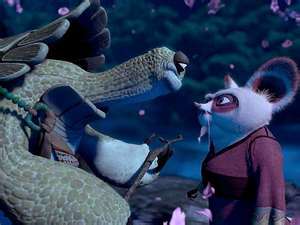 Shifu maintains great devotion to his own Master Oogway, even when he seems to be behaving erratically and appointing a very odd choice for the Dragon Warrior. He questions his Master but listens carefully to his replies and is inspired by them. “Obeying the master is not a weakness” says Shifu to the snow leopard Tai Lung. Tai Lung shows the treacherous contrast of what happens if we let our pride and self-cherishing run out of control, and how feeling superior to our own teacher inevitably ends up sooner or later in hubristic disaster. Master Oogway says we have to accept that we cannot control everything. Shifu replies that we can control some things and shows this by hitting the Sacred Peach Tree of Heavenly Wisdom to get the peaches to fall and planting a peach seed from which a tree will grow. Master Oogway points out that we can only get a peach tree not an apple tree from that seed, teaching the definite relationship between cause and effect (karma). But then he shows the manner of passing away into the Dharmakaya Truth Body by dissolving into emptiness, showing that for whom emptiness is possible, anything is possible, as the famous Buddhist teacher Nagarjuna said. Po is lumbering and clumsy, at least for as long as he identifies with “me”, a limited self, in his case a big fat lazy Panda. But he doesn’t want to be “me” any more, he wants to change. And Master Oogway gives both Master Shifu and Po the confidence to believe in Po’s ability to do it, and believing is what we need to do if we are to let go of our ego, fulfill our potential and make spiritual progress. (However, unlike in the movie, we are all “chosen”). And Master Shifu also realizes there can be no cookie cutter approach to teaching one’s students, especially these days. The teacher and student sometimes need to think out of the box and find other ways, even if these are unconventional (and involve dumplings). Po’s humility is what enables him to succeed. He has an ingenuousness and zest for life that is very refreshing for the five great and good warriors who have gotten slightly institutionalized and by the book in the Jade Palace. Po is down to earth and unobsequious but at the same time entirely and humbly in awe of Kung Fu and its masters. For me he was an example of staying fresh on our spiritual path, devoted to the teachings, teachers and living beings but not rigidly going through the motions, becoming sycophantic and/or developing a superiority complex in an ivory tower. We need discipline, but we also need lightness of touch and the ability to respect each others’ differences. Even at the end when Po has defeated Tai Lung and the whole valley are prostrating to him and chanting “Master”, he doesn’t develop a trace of pride or identify with that praise. That word simply reminds him of his own master, so he turns around and rushes back up the steps to see him. And the other thing is that Po realizes something very important when he enters the mystery of the dragon scroll – he does not need to add anything at all from the outside to fulfill his potential. 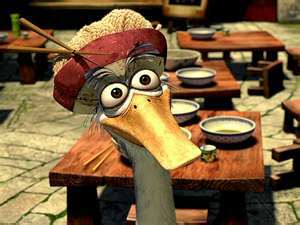 As his father, the goose Mr. Ping, finally confides about his Secret Ingredient Soup, the secret ingredient is …. that there is no secret ingredient! We don’t need a secret ingredient. We don’t need to be someone “special”. We all have the potential already to be great. This is our Buddha nature. Milarepa said that he regarded everything that appeared to his mind as a Dharma book. All things confirmed the truth of Buddha’s teachings and increased his spiritual experience. So, if we are going to watch movies, we might as well make them into spiritual teachings! Have you got a favorite example? what i appreciated about the film was that it challenged perception. It was interesting that although all of the fantastic 5 were different they segregated and oppressed Po based on his size mostly. They judged and stereotyped him and he was forced to confine himself into his current environment. I feel like this is an important philosophy to be embraced by this film. That we do not have to fulfill roles because they are their that there is a duty that we need to provide in following our dreams and that they tie in with our destiny. If Po was to submit to his role and what was expected of him then none of it would be possible. I also feel like its important to acknowledge the I DONT KNOWs in this film although they were MASTERS there were moments where they didnt know the answers to everything including master shifus master that in being a master doesnt make one all knowing…. Most importantly i was a lesson that was taught in the film that when the water is still we can see the answer but we must allow ourselves to not let our emotions get carried away with the situation. How beautifully your words emanate; like bubbles floating from the sphere of the blissful emptiness of all phenomena. I too had wonderful feelings watching this movie; and shared many of the interpretations that you have lucidly presented. I wanted to thank you from my heart for this blog. I think that you are truly living in accordance with the ancient wisdom of our venerable spiritual guide, and according to his wish, presenting Dharma and modern life as inseparable. Most of all, I think what is so special is that you individually reply to each and every post. Your effort is inspiring; it makes me wish to write more. Kind Regards. Simon, i was really happy to read this comment, thank you! I am trying to do my best, and I really appreciate your kind encouragement. Hi. Welcome to Kadampa Life! Very interesting take! I came to see Kung Fu Panda 2 but I will def write a kudos to you when I watch it and write a review on my east Asian film blog ! Your teachings are deep and peaceful like water in its stillness. May the Buddha bless you. Thank you. Your blog is beautiful, I look forward to spending some time reading it. You are most kind, may your merit increase. I really enjoyed your insights. I loved the 1st and the 2nd Kung Fu Panda. Both films have a great message. Could you make a review about what you thought of the 2nd film? Thanks for the post. Hi Kooky Guy, I haven’t even seen #2 yet! But I will, and, seeing as you asked, yes I will write another review! Thank you for the encouragement. Nice post and I really love the film too, I’m gonna go see no.2 when I get a chance! I often think of my meditation practice as a kind of mental kung-fu against the tide of negative thoughts and associations. In particular, in meditation, I familiarize myself with a train of positive associations on, say, the kindness of my wife. Then later, when I feel negative thoughts arising in my mind after something my wife does, I activate the positive train of associations; repeat until the negative association is pushed back. Without this opponent, negativity grows unopposed in my mind; anger, hatred, and confusion become outsized. As long as I have a consistent meditation practice, I can nurture this opponent force to sufficient strength to outsize my delusions. I suspect, over time, with enough meditation, the opponent force turns the tide, and all thoughts drift towards positivity… Kung Fu Mastery. What a fabulous analogy! Thank you JP. You have just equipped me with a way to battle my negative thoughts. Thank you. Yah, this web site is superb. That’s not actually a seriously huge statement, but its all I could come up with immediately after reading this. I’m so glad you found it helpful, Margarita. Infect that was a great movie and there were some remarkable dialogs between different roles. The movie is a nice thing to watch for both children and elders. Yes, its true, it works for all generations, maybe as the spiritual message is timeless? I agree with you. Movies can affect our minds quite deeply so it is good to be mindful of what we and our children watch. That’s really a nice extract from the film. Indeed we could gain alot from it. I will surely write about this in my blog. Indeed it’s an excellent post man. You have given us good extracts from the film. I will surely write something about you in my blog. Very well written!! Lovely interpretation. Haven’t watched Kungfu Panda-II. Will do so pretty soon. Now that I am all the more motivated to do so. Thank you for your kind comment Sapna. wonderful post! what the most I like is the ” just believe part” and “there is no secret ingredient” . both of them really inspire me. Thank you. It is true — we need to believe in our potential or we’ll never change and also we don’t need to wait for a secret ingredient from the outside as we already have everything we need. Thank you! I just took a look at your blog and it looks fresh, i’ll go back there. Thanks for the tip on the 3 Idiots, i look forward to it. 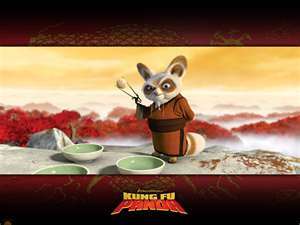 nice explanation of incidents of the Kunfu panda movie…. Really this movie got lot to learn….. Yes, you can find a lot in it if you look! Self belief is the mother of all the personal attributes that brings happiness, confidence and humility. I appreciate your encouragement and it is true that self-belief or self-confidence goes with humility not pride if it is based on the right things. I’m glad you like this! 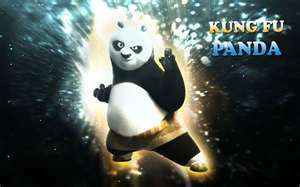 Kung Fu Panda is actually one of my favorite animated movies. As you point ou,t quite beautifully I must add, the movie has so many wonderful messages. Thank you for sharing your reflections with us. This post made my day. Great post!! Congrats on being Freshly Pressed!!!! Interesting how words and movies are placed in our paths when most needed. I just happened upon Kung Fu Panda while flipping channels on Sunday….and had to watch it once again. Such a great movie….with great teachings….I needed the reinforcement!!! Wow, I just finished this movie last night! I totally agree with your reviews! It’s great! My friends and I often discussed this idea of “There’s no secret ingredient”. It is overwhelming, yet inspiring at the same time. And I believe that such beautiful depiction of ideas can only be managed by the charming innocence, and beautiful characters that an animation movie brings along. Nice post, and I’m happy that you got so much out of the movie :). 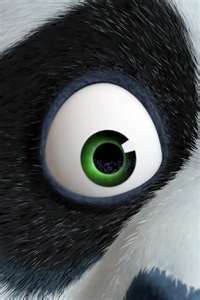 Well, on a side note, I am dying to watch Kung Fu Panda 2, but it hasn’t yet released in my country. Great comment, Nishant. I can see from your blog that you’re a mathematician philosopher, awesome as Po would say. Excellent! Fully agree with all that you have so eloquently put forth. Great movie, it’s hard to beat something that can make you laugh, think, and be inspired all at once. Thank you Writer Wren, and well said. I can see from your blog that you like birds, nice. Funny! I watched this movie just a few days ago and was thinking in quite the same lanes. I paid much attention to the messages as well, many of them made very clearly. The movie can be viewed as just another funny Jack Black-movie, or you can see it as a funny Jack Black-movie AND a movie with some very good spiritual points! Thanks. I saw your blog and can see why you had already thought along the same lines! Your blog is good. i love kung fu panda! im going to see the 2nd one soon! Fabulous post. I just saw Kung Fu Panda 2, and it’s good to go over the first one. I do like the messages in the movie, and you clearly identified them. Great job! I thought Part 2 elaborated on the themes of Part 1 and went farther in showing Eastern Religious thoughts. My son didn’t care for Part 2 as much as I did. He is only 7 and has more steps to take than I do! Congratulations on Freshly Pressed. Thank you. I haven’t yet had the chance to see #2 but I heard from friends that it shows how we only “conquer” the world through developing inner peace first. Was that what you thought too? I love Kung Fu Panda! As does my 2 year old son. And the messages are great. The movie does seem to have tapped into something that all ages can enjoy, like Harry Potter. Maybe as the message is so timeless. Thank you. The article is about #1, so you might want to see that before checking out #2 at the movie theater. What I enjoy about Kung-Fu Panda is that our children are learning these lessons unknown to them. Sure, and in this day and age that is a fine thing, with all that competes for their attention. Interesting philosophical view points. Like the blog !!! Thanks. I had a quick look at your blog and it looks original, i’ll go back there. How about Kung Fu Hustle… similar title and a good message. Sometimes movies come up short on giving a good message. Yep, they do. I don’t think all movie-makers are trying to give good messages. man i cant wait to see this movie!!! Just moments ago i was talking about kung fu panda with family. its mine n my mother’s fav movie. Very nice write up dear writer! I’m glad you liked it! Have you and your mother seen Kung Fu Panda 2 yet?! As the once great Bruce Lee said “As you think…so shall you become”, this article reminded me of that quote. Anyone can have potential for greatness as long as your mind put it into action. 🙂 Great post! Thank you for the Bruce Lee quote Jing Hu. Buddha also said something similar: “With your thoughts you create your world”. So useful to know that. I’m glad you like it, thanks. Today, I needed to hear that I must accept that I cannot control everything — even if it came in the form of a narrative analysis of an animated movie! But your post was full of insights and spot-on advice…and a timely message. Ha ha! Yes, we never know where we’re going to get our inspiration from next… if we’re open and using our wisdom, we can find it everywhere. And I get accused of over-analyzing things! Seeing as th new movie is 3D according to th busses going by tho; it’s good to be reminded that “with Dharma wisdom we can find a teaching in everything” (GKG, Joyful Path) I really love absorbing into a good movie ~ there are always Dharmic threads you can follow. My faves are Matrix (of course) and Donnie Darko. Loved it when Agent Smith says to Neo “you’re empty”, and Neo replies “so are you”. Guess they were talking about guns; but watching it in Ulverston’s cinema, it seemed like th whole place erupted with applause for Wisdom in action. Donnie Darko discusses actions and their consequences. “Every living creature on earth dies alone.” This scares Donnie, but in th end, he feels great, and his dying saves th future. ╰✡╮ I love that movies can challenge and inspire you, and really make you think. I like your blog, thank you. I recommend it to anyone reading this! It was so refreshing to read this blog (never seen the film, but I might have to take my nephews to see it now). it reminds me of when I had a more fresh and positive approach to things, including movies, and I could take a positive message away. Thank you for writing this post, it has reminded me of a lot of things I had forgotten about what I could be doing with my life. It feels good to be encouraged and even chided a little, but mainly encouraged.